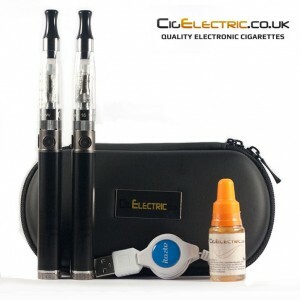 Thanks for purchasing the CigElectric PRO VV electronic cigarette starter kit! This guide will explain how to fill your starter kit once you receive it. It will also explain how to use and charge your battery, maintain your device and how to get the best performance out of it with some tips for usage. Please watch the videos, they may be the easiest method to learn how to fill your electronic cigarette. The CLK variable voltage battery has a spinner dial on the bottom to allow you to set your preferred voltage. By spinning the dial you can set the voltage from 3.5V to 5V in 0.2/0.3 increments. We recommend using a voltage between 3.5V – 4.3V for the 2.1ohm resistance clearomizers include with this kit. A lower voltage will give a cooler, light vapour and a higher voltage will give a warmer, thicker vapour with increased throat hit. You may find the flavour will also change, with different “notes” accentuated at different voltages. If you are getting a slight burning taste the voltage maybe set too high. To learn more about variable voltage please check out our Variable Voltage E-Cig Guide. Set your preferred voltage using the spinner dial on the bottom of the battery. We recommend starting at 3.8V. Remove the rubber plug near the battery button and plug in the micro USB charger. The CLK battery can be used while charging once the battery indicator turns green (this does not indicate a full charge). Once fully charged the light on the battery button will turn off. Unscrew the clearomizer head and remove the rubber cap that sits over the coil and wicks or replace with a new clearomizer head and re-assemble. Allow to fully dry then re-assemble.